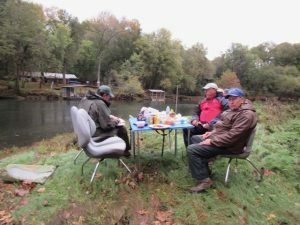 This week we had one of our regular groups from St. Louis, Mo, fly fishing with us on The Little Red River. Al, Joe, Larry and Glenn are all also part of the crew of T.Hargrove Fly Shop on Manchester Road in St. Louis, Missouri. If you have never been to T. Hargrove’s Fly Shop you owe it to yourself to visit. It is such a quirky, yet comfortable, place that it is a must see location with everything a fly fisher could desire piled into a really neat old house complete with a pot bellied stove and fly tying table in the entry way. Next time you go to a Cardinal baseball game be sure to stop by and visit the crew. 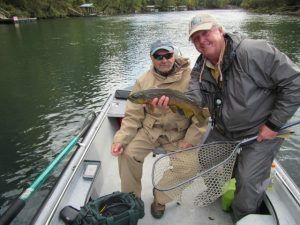 We had a great three days of fly fishing with great weather and good water levels. 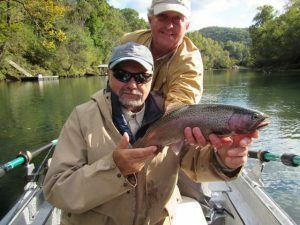 Make no mistake, these guys can flat out fly fish and they work hard at it! 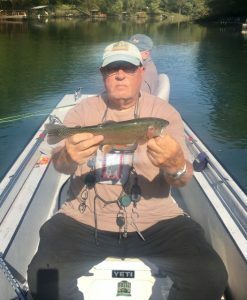 They caught a bunch of fish including several really stud Brown Trout and a special Rainbow. The big fish all took a #16 Original Ebbie on the last day of the trip. This is a group of old friends that obviously enjoy each others company. 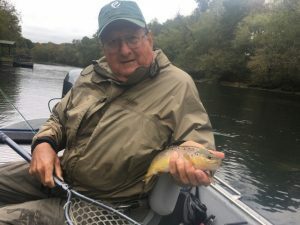 We enjoyed shore lunches of grilled chicken cordon blue sandwiches, brats and chili dogs while we all told and listened to lots of great fly fishing stories. It could not have been a better three days and we certainly look forward to the next visit from our St. Louis crew.